The flat barbell bench press... the lift that everyone wants to know how much you can do when they find out you train. So you want to get your numbers moving in the right direction again? These 10 quick tips will make a difference in your strength and boost your bench FAST. Keep in mind, these tips are coming from someone who has almost NO genetic gifts as far as bench press is concerned (bad shoulders, long arms). It's among my weakest lifts and I have to struggle for every single pound I add onto it. Yet with those limitations, using the tips I'll share with you below, I've managed to work up to a maximum single at 350 lbs. So it CAN be done. 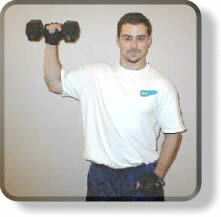 The exercise that I use is one I call the "3 In 1 Rotator Cuff Raise." It's an exercise I came up with to work all 3 major planes of movement that the Rotator Cuff muscles operate in in one basic movement. It's very effective and very time-efficient. Two sets of 8 reps of this at the end of each workout is all you need. 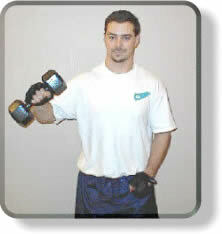 Here is a quick rundown of the 3-in-1 Rotator Cuff Raise exercise. Start in a standing position with your upper arm vertical, your forearm crossed in front horizontally and your shoulder internally rotated. You will be holding the dumbbell in front of your abdomen. This is similar to the start position of what is called the Lying "L" Raise (a common rotator cuff exercise) where you lying on your side on a bench. In this exercise you are in a standing position. During this entire movement, your should keep a constant 90 degree bend in your elbow. Externally rotate and abduct your shoulder (raise your upper arm up and to the side while bringing the dumbbell up and back). What this is that while you raise your upper arm to a horizontal position, raise your forearm to a vertical position. This should be accomplished in a smooth motion. Where you grip the bar can make or break your bench press before you even do a single rep. If you grip the bar in too close, you're putting more stress on the triceps, which limits your pushing power and increases the distance you have to press the bar. If you grip the bar too wide, you do decrease the distance the bar travels but you put excessive stress on the shoulder joints. So what is the best place to grip the bar? This is best determined with no weight on the bar at all and with somebody watching your form. Lie down and take the bar off the rack and lower the bar to your chest. Have your spotter eyeball your forearms. At the bottom of the press, your forearms should be perfectly vertical. THAT will give you the greatest pressing power as you won't lose any power inside or outside. It's the same concept as throwing a punch - if the bones of the arm aren't lined up properly when it connects, you lose a lot of power at impact. When you're doing a heavy press, trunk stabilization is much more important than when you're doing lighter, higher-rep training. You need a strong, solid base to push off of to really move the most weight. When doing a heavy lift for only a few reps, breathe in deeply on the way down, inflating your chest as much as possible (this has the dual effect of increasing the stability of your trunk AND decreasing the distance the bar must travel, which is a bonus!). But as you press the bar off your chest don't immediately blow out all your air in one big blow. That will destabilize the chest and weaken the base you're pushing from. Think of it this way...it would be like trying to do a dumbbell press on the Swiss Ball as somebody is letting the air out of it FAST. So as you start to press the weight, blow your air out through pursed lips. Basically, pretend you're blowing up a really thick balloon. You want to keep your breathing muscles in your rib cage absolutely solid as they very slowly force the air out. This keeps your trunk solid and stabilized as you press, which is critical. The moment you lose that stability, you lose the lift. Remember what I said about stability in the previous point? Your back makes up a BIG portion of that base that stabilizes your body. The wider the base, the bigger the structure it can support (i.e. more weight). A comparatively weak back will reduce the amount of weight you can bench. The second point is thickness. The thicker your back, the shorter the distance the bar has to travel and the more weight you'll be able to lift. Look at how thick the torsos of the best bench pressers in the world are - they have huge barrel chests, thick backs and relatively short arms - their range of motion is probably about HALF of what a "normal" person's range of motion is with the bench press. The thicker your back, the shorter the range of motion and the more weight you'll be able to press. The third point is muscular balance. If you're constantly doing pushing movements, your body will overdevelop those pushing muscles, which will lead to unnatural shortening and potential weakness. You MUST work the back muscles to pull everything into proper alignment. Walking around with your shoulders hunched forward and your arms bouncing around in front of you doesn't look cool - I can promise you that. Leg drive is VERY important to maximizing your bench press strength on maximum lifts. When you set your feet for benching, don't just place them anywhere and let nature take its course. Set your feet solidly on the ground and bend your knees to about 80 degrees. Here's why...when you're at the bottom of the bench press, driving with the legs can help you get that weight moving. You can demonstrate this to yourself by lying on the flat bench and setting your feet on the ground. Now think of how you'd need to set your feet if you wanted to use your feet/legs to slide yourself up the bench. THAT is what you do when you drive with your legs - you basically try and use your legs to slide yourself up the bench. But because the weight is holding you down, that force goes to helping push the weight up. This goes back to trunk stability. If you're not consciously and religiously squeezing your shoulder blades together when you set yourself up on the bench press, you're instantly putting yourself at a disadvantage. To do this, lie down on the bench and grab the bar. Lift your body up off the bench then try and touch your shoulder blades together behind your back. Get them tucked in as tight as possible. When you set yourself back down, you'll find you're not only more stable on the bench but your shoulders are in a stronger pressing position AND your torso is actually a little thicker (which means shorter range of motion). One big thing that's often missing in the training routine of a person looking to maximize strength is a focus on connective tissue training. You can build huge, strong muscles but the movement is only as strong as the weakest link. If that weakest link is connective tissue, best case is it will limit the amount of weight you can lift. Worst case, you'll snap your tendons when your muscles move weights that your connective tissue can't handle. So how do we strengthen connective tissue? That requires VERY heavy weight, the kind that can only be used with partial-range training like lockouts in the rack. For building up your connective tissue specifically for bench press, DEFINITELY work on rack lockouts and static holds with substantial weight. Learn more about lockout partial bench press. Bands are one of the most useful training tools you can use with the bench press. There are two main ways to go...working AGAINST the bands to increase explosive power and working WITH band assistance to move more weight and more closely mimic the strength curve of the bench press (harder at the bottom, easier at the top). When using the bands to work on explosive training, you attach them to something solid on the floor and then to the bar. You use a lighter weight on the barbell for these. Then, when you lift, you explode up as fast and as powerfully as you can against the bands. The bands stretch as you come up, slowing the bar so your muscles don't have to. This teaches your muscles to fire more explosively. The other method is to use the bands for assistance (called Reverse Band Bench Press). With this technique, you attach the bands to the top of the rack and to the bar below. As you lower the weight, the bands stretch, making the bottom of the press easier by removing some of the resistance. As you press up, the bands lose tension, making you press more of the weight yourself, which exactly mimics the mechanics of the bench press. One of the best things about the decline bench press is that you can use a bit more weight on it than you can on the regular flat bench due to the change in biomechanics and somewhat decreased range of motion. Working with heavier weight is good in two ways - mentally and physically. Mentally, it helps prepare your mind for working with heavier weight. Physically, it helps prepare your body for handling heavier weight on the flat bench (via connective tissue strengthening and nervous system activation). The first is safety. You can easily set the rails to just slightly below the bottom-most position of your bench press. If you can't finish a rep, you just set the bar on the rails, roll the bar forward and slide yourself out from under it. No harm done, no spotter necessary. You can't do that on a regular bench press station! The second is the freedom to REALLY PUSH YOURSELF without fear of dropping the weight and not being able to get out from under the bar. When you're in a regular free bench press station, there is always that nagging fear that if you don't make a lift, you're going to have the bar come down on you. When you do your pressing in the rack with safety rails set, that will NEVER happen and you can really free yourself to push things to the limits without having to worry about crushing yourself under the bar. I have ALWAYS found it ironic that the station where people do one of the most dangerous exercises in the gym (and quite often lift more weight than they can safely handle on it) is the one station that has almost NO safety measures built into it. Think about it this way...when was the last time you saw somebody get crushed under a barbell curl, yet how many times do you see people doing curls in the rack while doing bench presses on a free station. So basically, set yourself free and do your pressing in the rack. You can push yourself harder and fight through those sticking points without worrying about getting stuck under the bar if you don't get it. If you want to maximize your bench press, put these tips to work. You'll starting noticing a very big difference in how much weight you can lift almost immediately AND in the long-term. If you want to train your chest to press more explosively, try the ballistic Barbell Bench Press warm-up here.